To keep or not to keep .. that is the question. Ok, maybe it’s more like to rehab or not to rehab. I’ve been wanting an old Stanley Jack plane to fix up and call my own .. and use, of course. I so loved the frog on my little No. 3 that I just fixed up, I decided to see if I could find the same frog/aged plane for a good price. I’m still cleaning and working on the plane, but here’s the major(?) flaw with the plane. Click on the picture to get a better look. There’s a crack in the mouth. It does not appear to go all the way through. So what da ya think? Spend time on cleaning it up or just mount it on the wall? As far as I can tell, it’s a pretty cool plane. Check out the lever cap and the frog. Here’s what I’m thinking. I work on it for a couple of hours, add a Hock blade and if the plane blows up I find another old one to rescue. So really, I’d love to know. Is the crack a sign of a plane not worth the rescue? 16 Responses to To keep or not to keep .. that is the question. The crack is common. It should still work as a rougher. 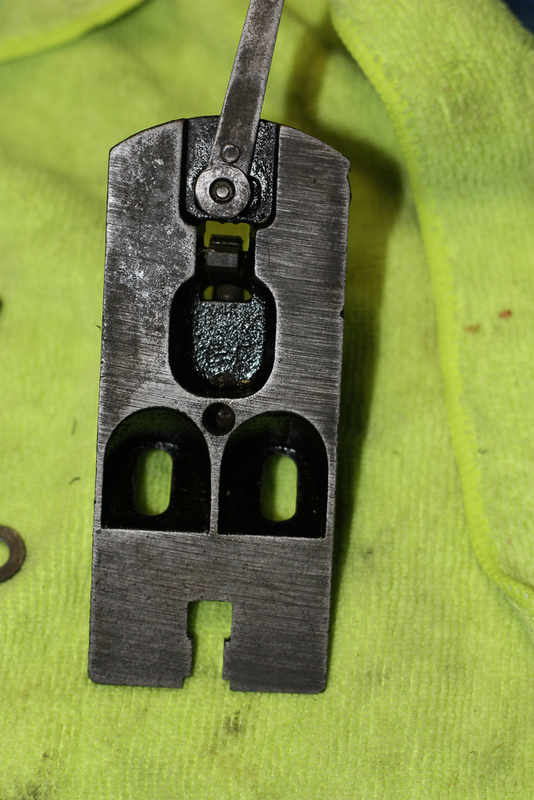 The lever cap is from a Stanley transitional plane. Interesting. So its not the original lever cap? I wondered. Roughing is what I had in mind for this. So that sounds like a good fit. 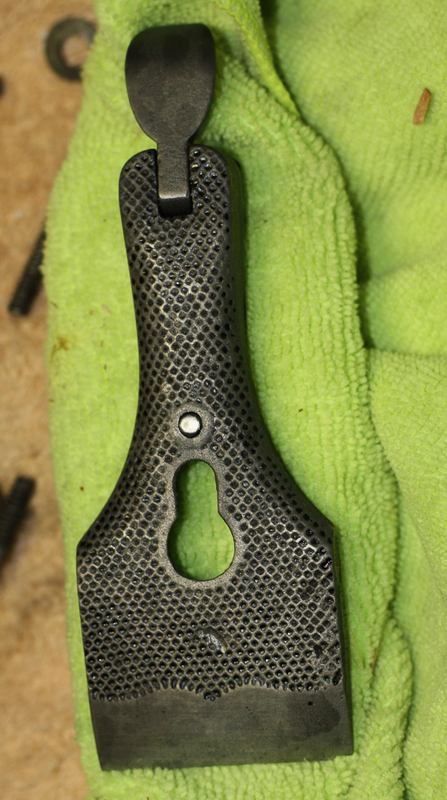 I have a lot of mixed emotions when it comes to tool restoration that I won’t bore you with. But it seems to me that you have the skills to do it. I’ve read that sole flatness is much less important than twist if that makes sense. I have a question for you if you don’t mind. I have a Stanley #7 type 10 that I’ve been working on the past few weeks. It’s been coming along nicely and my only real problem is the iron, which is in good shape in the sense that there is no corrosion with an excellent amount of steel left. However, there are a couple of nicks that I won’t be able to completely remove with the equipment that I have. Rather than buy a Tormek, I would rather replace the iron. I’ve seen that Veritas offers replacement irons for Stanley, I’m just not sure if they would work on such an old plane. Do you have any sources for replacement irons that you would be willing to share? Thanks. I use Hock blades (http://www.hocktools.com/BP.htm). You don’t have to widen the mouth and I’ve I think Ron knows a ton about steel. I’m sure that Veritas and Lie Nielsen blades would also work well. This is why I’m not afraid to use and an old plane. If needed, you can get a good blade pretty easy. Hey Ron! Thanks for the thoughts. Do you have a good resource for these or do you just use ebay? To interject, I’ve seen good examples on Ebay and Jim Bode tools. yes, those are both good sources. The only thoughts I would add is that on ebay, its sometime tuff to tell if you’re getting a good plane and .. I .. would classify Jim Bode’s site a point more toward collectors. But I have purchased from both. Hyperkitten remains my favorite source. I agree with you on both points. Jim Bode’s tools are perfect for somebody like myself though, because I don’t have as much time as I would like( or all of the necessary equipment to do a full rehab on an old tool. I’m more of a give it a good cleaning and sanding, and hone the blade guy. Bode’s stuff fits me to that extent. I haven’t tried Ebay except for some old bits which I had no issue with. Other’s I know tried ebay for planes with mixed results. I’m finally going to get a chance to put it back together this morning and see 1) if I can get a snugly clamped blade with a non-original lever cap and 2) see if the mouth distorts when I do it. We’ll see. Marilyn, if it does distort send it my way and I can try welding it. Marilyn, if that crack is running from the back of the mouth toward the back of the plane you should be good. I rehabbed a 1890’s Stanley 4 1/2 that had heavy metal loss at the back of the mouth. 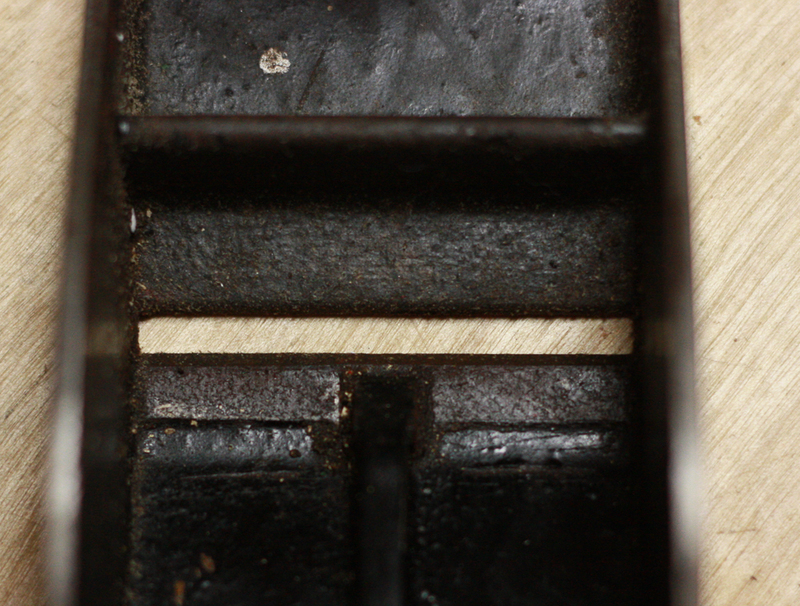 I filed away about 3/16ths of jagged metel to create a nice clean line. The plane runs great. Good luck. Wow! I would have thought that would have made it hard to work with. Good to know! Thanks! 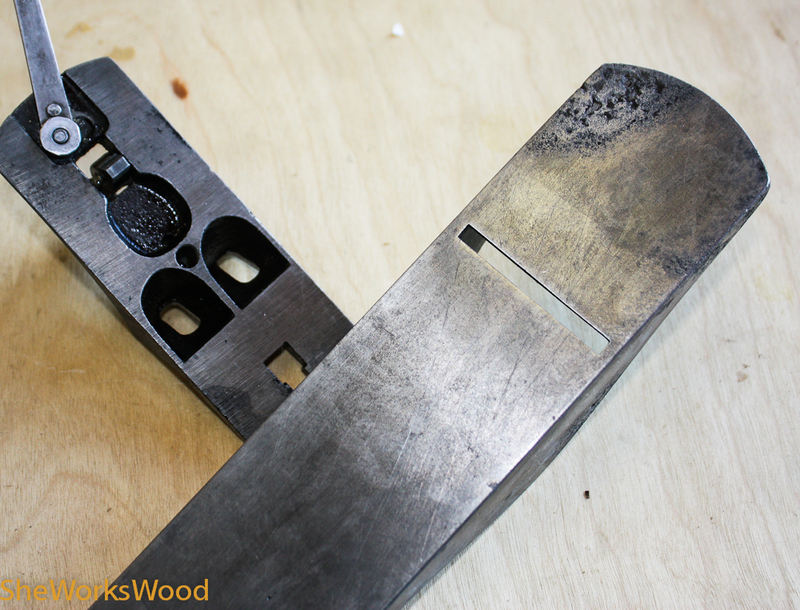 All the work happens at the front of the mouth, especially as you know on a nice finish/smooth planes. I use the 4 1/2 as a smoother with great results. 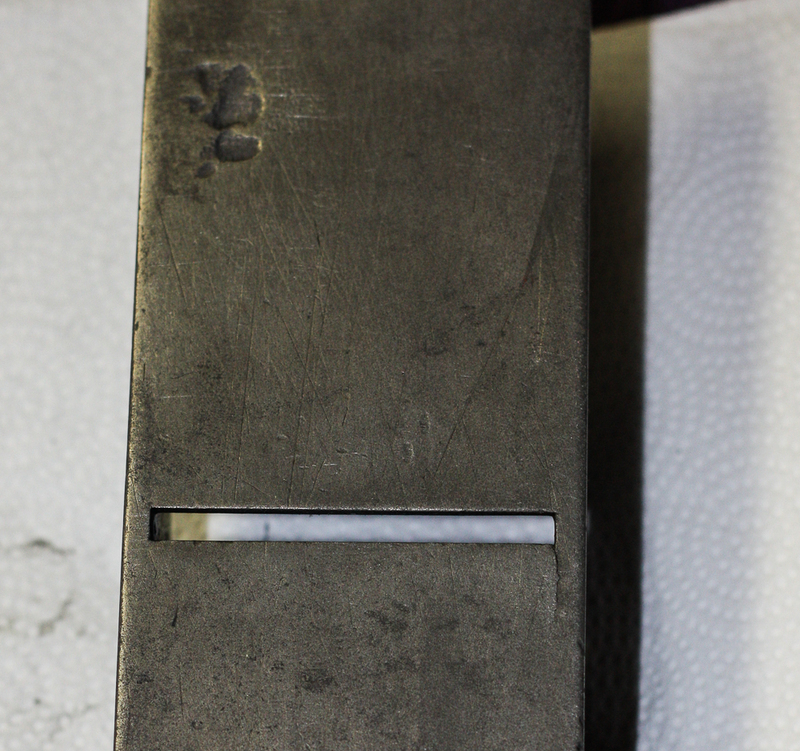 Someone once showed me how some folks set up Japanese planes by putting slight hollow behind the mouth to help reduce friction, so I figure what the hack, file it back to clean medal and see what happens. In your case I’d let it ride. Enjoy.